AFC Bournemouth fought back again to draw 2-2 with Everton as both sides had a man sent off in a game of high drama. Not for the first time between the two sides, it was a tense and frantic pace starting with the away side seeing red first, with Richarlison given his marching orders after a headbutt on Adam Smith. However, Everton broke ten minutes into the second half to open the scoring, Theo Walcott steamed into the box and finished with power. But shortly afterwards, Adam Smith was the second man to be red carded after he fouled Walcott racing in on goal. A Michael Keane header doubled the Toffees' lead, before Joshua King pulled the Cherries back into the game from the spot with 15 minutes left to play. Nathan Ake then secured a point for the Cherries, as he followed up Callum Wilson's header, but despite late pressure the home side couldn't find a fittingly-dramatic winner. There was a high-octane start to the match, with the Cherries creating the best chance of the first-half. Smith surged and played inside to Ryan Fraser, who picked out a free Callum Wilson in the box, but the in-form striker - in acres of space - blazed over from 15 yards. It was a glorious chance, but the visitors grew into the contest before conceding the upper hand with a moment of madness. 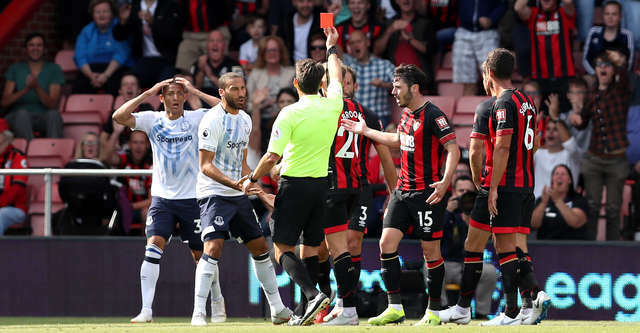 Richarlison - the star man for the Toffees so far this season - was involved in an altercation with Smith off the ball, appearing to move his head into the face of the Bournemouth man. Referee Lee Probert was quick to draw the red card, much to the bemusement of the spectators who had missed the incident. Level at the start of the second half, the Cherries were soon pushing to reflect their numerical advantage on the scoreboard, but the breakthrough would come at the other end in the 56th minute. A quick Everton out ball allowed Tosun to play forwards for the onrushing Walcott, with the former Arsenal winger lashing home with a good angled finish. The game's next major swing saw Smith given a red card as the numbers were evened up at ten a side. The Bournemouth full-back was chasing Walcott, potentially in on goal, and after the assistant ruled Smith had fouled his man Probert produced his second straight red card of the afternoon. Begovic saved the resulting free-kick well, but the mountain became steeper when Everton netted a second. Gylfi Sigurdsson's ball invited his team-mates to run forwards onto the ball, with Keane up from the back to do that as his downward header squirmed under Begovic and over the line. Despite being 2-0 down the Cherries never lost their cool, with King spraying a magnificent ball through for Wilson to chase down one-on-one, but Pickford was level to Wilson's second big chance of the contest. But the hosts soon had an ideal chance, taken this time, when they were awarded a penalty kick. Wilson was pushed over in the box and King took over the spot-kick responsibilities to calmly slide home a finish for his first of the season. A breathless game then took another turn as Bournemouth levelled the scores in typically dramatic fashion. A corner from the right was met by Wilson who headed a sublime effort onto the inside of the post - it bounced out and Ake was there to tap in and send the fans into delirium. Into the closing stages and it remained the home side with their tails up, a long delay taking place as the game ticked into added time as Keane received treatment on the pitch and left on a stretcher. Six minutes were added on but neither side were able to find a winner typical of the sides' Vitality meetings, both sides leaving the field with their unbeaten Premier League starts intact. It's very much a recurring theme for the Cherries. Since the 2017/18 season, no one in the Premier League has earned more points from losing positions than us - 25 in total. A remarkable stat. The result as it stands, takes the club to second and level on points with Manchester City. The peak of the Cherries' attack asked questions all afternoon of the Everton backline. Wilson hit the post with a fine header, raced on to strike-partner King's pass and won a penalty to help the hosts get a foothold back in the game. It's something that manager Eddie Howe mentioned in his press conference after the West Ham United game, that the partnership was something that the pair had been working hard to get right. 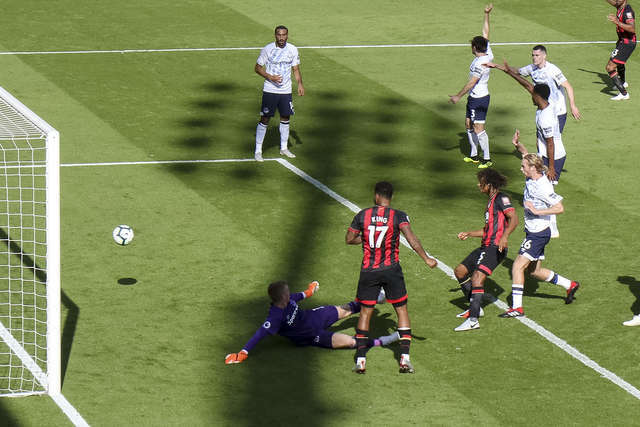 Wilson - who took a penalty in the Cherries' first home game this season - allowed King to take the side's second spot kick of the season, epitomising the understanding between the two forwards.